Samsonite Bantam XLT 2-piece Hardside Luggage Set, Gray, 9/10 NIOB. Split Ball Sphere Spinner Wheels. Polycarbonate Shell. TSA Integrated Lock on Checked Piece. Top and Side Carry Handles. Carry-On Piece. Wheels: eight-directional spinner wheels. Color: Orange. Size: 20"'. Exterior Approx. Weight: (20") 6.3LBS. This SAMSONITE S’CURE Suitcase is made of “FLOWLITE”, a revolutionary new polypropylene mix. Fabric Composition: Polycarbonate. The three-point locking system allows travelers to lock their suitcase when in motion. Darcey Small Wheeled Luggage from Kipling Airline carry-on approved! You and your luggage will stand out from the crowd with this vibrant, eye catching wheeled suitcase. The durable nylon exterior is soft in structure so it won't put the squeeze on your favorite clothes. If you are going to head out the door, do it with peace of mind. Be ready for anywhere. Samsonite FreeForm. With a built in combination lock, the Samsonite cases are good to go no matter where you are. Traveler's Choice Red 21" in Sedona Lightweight Expand able 100% Pure Polycarbonate Carry-on Upright S pinner Luggag e. Great looking set of luggage! (on Sedona 3-Piece Spinner Set). Great set and so lightweight! HARDSIDE SPINNER CARRY ON SUITCASE. VICTORINOX SWISS ARMY NOVA 21" FREQUENT FLYER. Ultra Strong Makrolon Polycarbonate shell. USB Port for charging on the go. Hard Side with Textured, scratch-resistant finish. 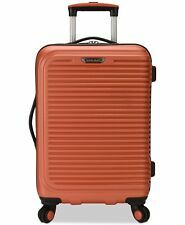 TAG MATRIX 20" HARDSIDE SPINNER CARRY ON SUITCASE RED RETAIL-$220.00 Material: durable ABS that is lightweight Wheels: 4 easy-gliding, smooth-rolling spinner wheels Lightweight: 7.18 lbs Dimensions: 14"W x 20"H x 10"D.
40" Rolling Wheeled Duffel Bag Spinner Luggage. Six sturdy 360° swivel wheels for easy rolling. Bag body can be expanded by zippers from 24" to 32" to 40" high. Material: 600 D Polyester. Color: Black. Spinner Wheels Briefcase. NICOLE MILLER TAYLOR. 360 Degree spinner wheels. This beautiful luggage is your ticket to stylish travel season after season. Top easy carry handles. Travel with decadence, sophistication & class with the Marie 21" hardside carry-on luggage from BEBE. Made with lightweight polycarbonate, it is durable yet versatile. Our beautifully crafted 8 wheel, 360 degree spinner system and aluminum trolley handle are both functional and chic, which will allow you to travel fashionably with ease. Wheels 4-Wheeled Spinner. Color Night Blue. Wheels, handle, zipper, lock are in solid working order. All spinners include integrated TSA locks. Weight 9.2 lbs. Lock TSA Approved combination lock. Handle Adjustable Aluminum Handle. Part Number - 07644PL. Manufacturer - Delsey. Item has small dents throughout, is dusty and has a small scuff on side. HARDSIDE SPINNER COLLECTION. Streamline your travel. Sophisticated style and striking durable ABS hardside construction exteriors with faux leather inlay trim keep your travel entourage in check. A sleek, sophisticated look gives your trip a stylish start that this versatile luggage set carries through the entire adventure. 36" Jumbo Duffel Bag. Material: 600D Polyester. Weight: 3.5 lbs. 10 Year Manufacturer Warranty! |St yl ish, feather light weight,durable and flexible! 1x official TSA lock. Very happy w/ my lovely pink suitcase collection. More from the Freedom Luggage Collection Features. Part Number - 701-WHT. including wheels and handles. You will receive everything in the pictures.